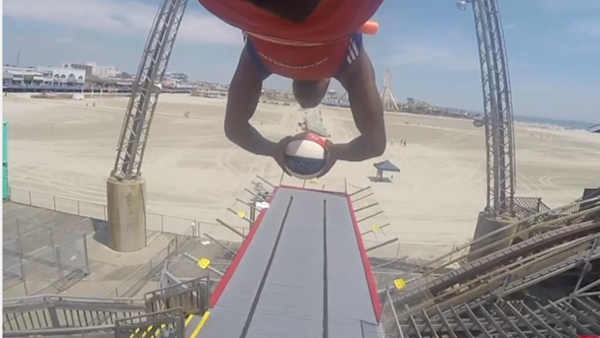 WILDWOOD, New Jersey (WABC) -- One of the stars of the Harlem Globetrotters went airborne high above a New Jersey beach to make a shot that has to be seen to be believed. Prior to four games in Wildwood, Bull Bullard made a shot the Globetrotters said was unlike anything ever attempted. With a basketball in hand, Bull was lifted 110 feet in the air on the SkyCoaster ride at Morey's Piers. He pulled the cord, swung at a peak speed of 60-mph, and made the shot to a hoop below on the beach. Bull, who has competed on "American Ninja Warrior," made the shot on Tuesday prior to the rides at Morey's Piers opening to the public. The Globetrotters play four games at the Wildwoods Convention Center from July 27-30.